While Sanibel Marina is one of the prettiest places on earth, it’s also small and a tad cramped. So I wasn’t surprised to see proprietor Mynton Ireland, a crusty old gent who’s undoubtedly seen his fair share of docking disasters over the years, watching me like a hawk as I began pivoting our sparkling Hunt 52 test boat in front of the offices of Ireland Yacht Sales, preparatory to backing into a slip. “Sweet,” I murmured as the 52’s stern swung gently into a perfect lineup with the outboard pilings and her nose cleared an East Bay parked broadside across the way. My back rested against a beefy teak steering wheel. The view aft (or anywhere else for that matter) was virtually unlimited, thanks to an encompassing array of side windows, windshield panels, and stainless steel-framed glass sliders at the rear. And my right hand toyed pleasingly with a definitively detented Glendinning electronic engine control…click, click, click. This last detail’s critical. 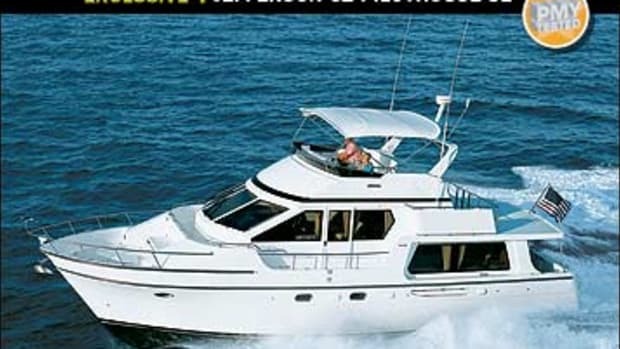 Plenty of boat companies these days install engine controls well to the right of their wheels. But try getting this sort of thing to work comfortably when you’re facing aft while maneuvering astern. If you favor your right hand the way I do, you’ll either have to turn like a contortionist and reach behind your back or else give up and go with your left hand. Hunt’s placement of the 52’s control—well to the left of the wheel—is way more sensible, with the joysticks for the electric Lewmar thrusters nearby. This setup makes for comfy, intuitive backdowns, for both right-handers and southpaws. Ireland now stood at the rear of my slip, with one bushy eyebrow raised. My bow was falling off to port, it seemed. 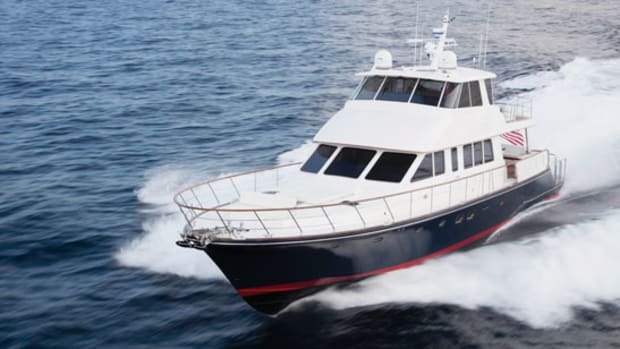 I tapped the bow thruster, returning both boat and eyebrows to the proper alignment, and then, with a nod from Ireland, bumped the mains astern for a second or so and slid the 52 home with all the drama of a stifled yawn. The way it looked to me, I’d had only about three inches of wiggle room on either side during the whole maneuver. “Decent job,” Ireland remarked at length, as we tweaked springlines from the side decks, which were wide enough for two guys to pass each other going in opposite directions, by the way. Earlier that morning, out on a calm San Carlos Bay, the 52 had done a pretty decent job herself. Not only had she turned in a comfortable, responsive, and balanced performance—the majority of running attitudes I’d measured were an optimal 4.5 degrees—she’d also produced ample visibility over the bow coming out of the hole and “a right fine turn o’ speed,” as we say in the sunny south. 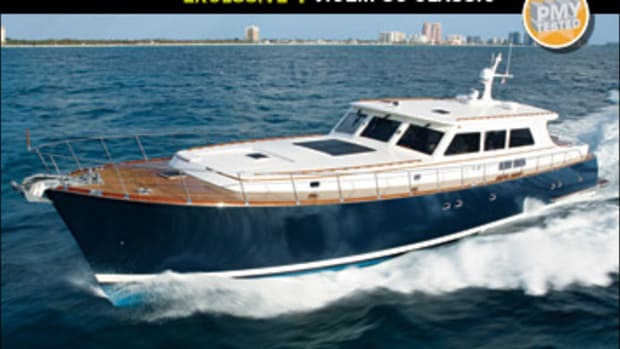 With both primary and secondary fuel tanks full, she’d posted a top hop of 41.3 mph, an operating efficiency of .41 mpg, and a range of approximately 240 nautical miles, with a ten-percent reserve. More-over, her turning radius had been a mere three boat lengths by my estimation, her Lenco electric trim tabs had proved unnecessary, and, thanks to opening side windows (they zoop down electrically), an opening windshield port, and an opening 5&apos;0" x 7&apos;0" sunroof, the driving ambiance had been cool and wafty. There are reasons for all this sweetness and light, of course. 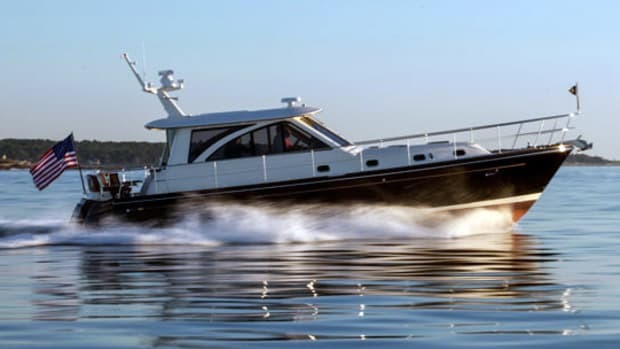 Hunt’s naval architectural adjunct C. Raymond Hunt Associates—founded by Ray Hunt, the inventor of the much-touted deep-V hull form—has been designing pilot, patrol, and other vessels for military and commercial enterprises for years. 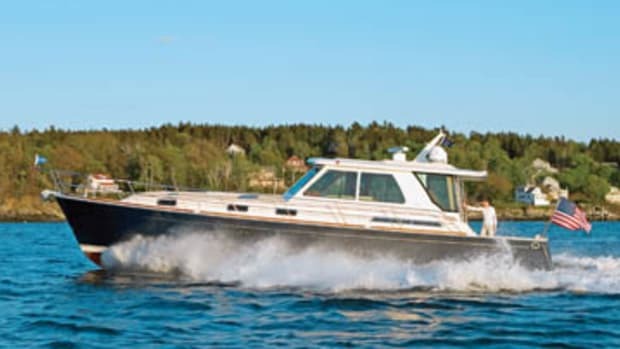 Indeed, the configuration of the 52’s deep-V running surface (transom deadrise: 20 degrees) is similar to the one that undergirds the Gladding-Hearn Chesapeake Class 53, an all-weather pilot boat that predominates in ports from Nova Scotia to California. Military-spec performance doesn’t preclude a luxurious interior, though. After Ireland and I’d completed our tie-up, I went below for a solitary look-see, checking out the full galley to port, the master forward (with en suite head), and the guest to starboard. It didn’t take long to conclude that here were sumptuous, varnished-cherry accommodation spaces that promised not only a good night’s rest but plenty of elbowroom in the shower stalls, lots of ambient light (through the windshield above the galley as well as a number of ports), and all the other joys an elegant life afloat offers. Just two features are worth closely detailing, one intriguing and the other problematic. The first (and the intriguing characteristic) centers on the orientation of the queen-size island berth I found in the master stateroom—at the owner’s behest, it had been rotated so that the head was aft and the foot forward. Sure, the thinking behind this custom switch is unique—the boat’s owner is reportedly a retired Navy guy who used to sleep feet-first onboard ship. But not only does such an arrangement give the berth’s occupants virtually unlimited headroom for reading in bed, the console that supports the head also delineates a sort of dressing area abaft it. Sensible? More convenient than the head forward arrangement? Undeniably! 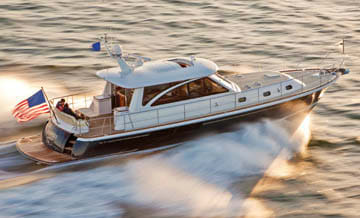 The second feature surfaced in the engine room, a spot that’s surprisingly spacious (headroom’s 5&apos;1" and there’s a full 2&apos;4" between the mains) and easy to negotiate, considering the potential intrusiveness of the garage required for the 52’s custom tender, an 11-foot hardshell beauty outfitted with a 20-hp four-stroke Yamaha, a protective ring of Taylor Made’s Gunwale Guard, and teak floorboards. A set of large hoses with matching seacocks at the rear of the ER connects what Hunt calls “a mini-sea chest” with a couple of giant Groco sea strainers way forward. This is a fine setup except for one thing—the hoses and the hose clamps that secure them to the seacocks are exposed to foot traffic. Indeed, I was tempted to stand on one myself as I finished reconnoitering the engine room before departing the vessel. Hunt should add a removable deck panel to prevent an inadvertent rupture. “You’ve got a beautiful marina here, Mr. Ireland” I synopsized as I made my way to my rental car, test gear in hand. 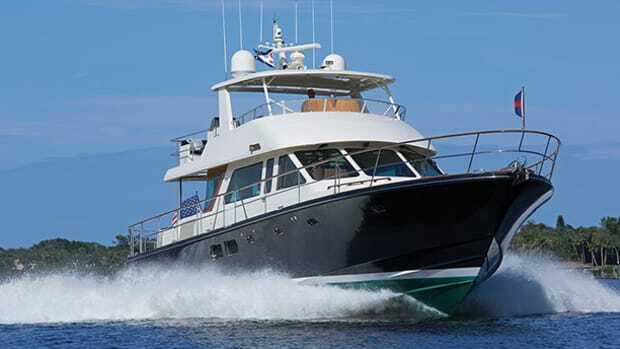 Ireland gave a taciturn nod and then, as if struck by an afterthought, enthused briefly about the Hunt 52’s military-spec pedigree and the rousing performance she engenders, both dockside and offshore. 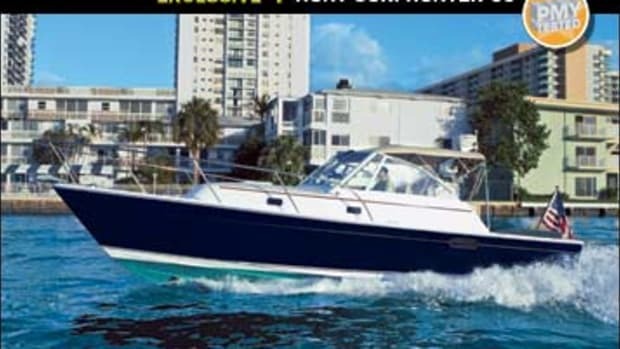 Hunt Yachts (401) 324-4201. www.powerandmotoryacht.com/hunt. 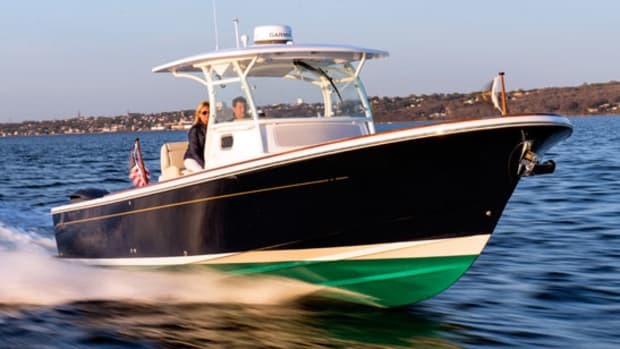 Perhaps because the folks at Hunt Yachts designed some of the original Whalers back in the day, the 52’s custom tender looks a little Boston Whalerish. 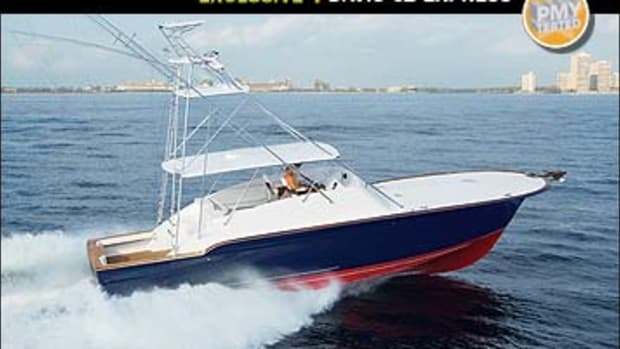 As it turns out, however, the Shell Back (as she’s called) is a V-bottom boat, not a foam-filled tri-hull, and she’s constructed in a more mainstream way, with a fiberglass hull, interior stiffeners, and an innerliner being the major constituents. What a fine little center-console, though. She’s got wheel steering, two benchseats, teakflooring planks, and a four-stroke Yamaha. 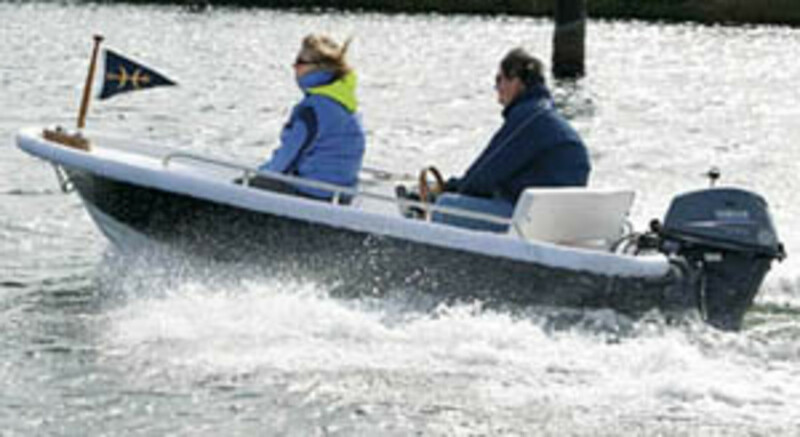 Moreover, Taylor Marine’s canvas-like Gunwale Guard keeps her from marking up the hull sides of other, larger craft. — B.P.